How Much Does Climate Science Matter In A World Run By Politics? Welcome to FiveThirtyEight’s weekly politics chat. The transcript below has been lightly edited. sarahf (Sarah Frostenson, politics editor): So the Friday after Thanksgiving, the National Oceanic and Atmospheric Administration, along with a dozen other federal agencies, published a hefty report on climate change that contained some pretty bad news: The U.S. and world face dire environmental consequences if immediate action is not taken. But … that isn’t exactly a new finding. What seemed to be particularly noteworthy (other than the timing of the release, which came when many Americans, including reporters, are taking time off from work) was that it involved a number of federal agencies essentially contradicting every stance President Trump and his administration have taken on climate change. You were on Friday’s press call, Maggie. What do you make of it? maggiekb (Maggie Koerth-Baker, senior science writer): Yeah, it was interesting. I’d say there was a good 45 minutes of that press call that was different reporters trying different ways of asking the same questions: Why is this thing being released the day after Thanksgiving, when that wasn’t the original plan? What do you think of the president’s rejection of climate science? What does it mean when your report and the White House contradict each other? And each time the people from NOAA and the National Climate Assessment would just kind of stonewall them. Back and forth — a question about the politics, a response about how the real news is the results of the research. clare.malone (Clare Malone, senior political writer): And I’m guessing the leading questions from reporters in the vein of, “Why was this released the day after Thanksgiving?” have to do with the administration trying to tamp down coverage of the findings, right? maggiekb: Yup. And the answer wasn’t very satisfying. They kept saying it was because they wanted the report to be out before a couple of big, upcoming scientific meetings where people will want to talk about the findings. But they never responded to the point that, you know, you could have accomplished the same thing by releasing it this week. natesilver (Nate Silver, editor in chief): OK, let me ask a dumb question of the rest of you. Why would the White House let the report be released at all? Could they have just squashed it if they wanted? clare.malone: I believe it is legally required for them to produce a report. natesilver: See, that’s why I said it was a dumb question. maggiekb: Yeah, these assessments started because of an act of Congress. But it’s not a dumb question at all. I had to stop and think for a minute and remember that. sarahf: I think it was smart of the Trump administration to not be visibly involved and to avoid the debacle the George W. Bush administration faced after a memo surfaced showing how they wanted to sow confusion about whether scientists agreed on the existence of global warming by changing the language they used to describe climate change. clare.malone: Yeah, the Bush administration got in trouble with the way they tried to finesse scientific findings! In the lead-up to Trump’s inauguration, we wrote about the ways that previous administrations have fudged public releases of scientific data. maggiekb: I think I’m mostly surprised the Trump administration hasn’t replicated what Canada did. Back in the early 2010s, the conservative government basically just blocked all federally funded climate scientists from talking directly to the press. There were several years where papers would come out but you couldn’t get interviews with any Canadian authors. clare.malone: But political finessing works! I was honestly shocked by the findings here. The idea that people with more education who are Republican are less inclined to be worried about climate change just seems so counterintuitive. sarahf: I, too, was really surprised by that piece, Clare. The split between parties tracks with what we know about how divided Americans are by political party about climate change, with Republicans largely opposed. But do we think that some of education-based split within the GOP could be because Republicans with less education are more likely to live in rural parts of the country that are more directly impacted by climate change? clare.malone: I don’t think the regionalism thing sounds exactly right, but what do I know! I did buy the idea that college-educated Republicans might be more attuned to the ways that the issue was politicized, i.e., greater exposure to partisan news sources. natesilver: OK, another dumb question: What degree of independence does NOAA have? Could Trump try to install a bunch of climate “skeptics” within leadership positions at the agency? sarahf: Ha, remember how well Myron Ebell worked out as the head of the Environmental Protection Agency as part of Trump’s transition team, Nate? maggiekb: Also not dumb, Nate. I honestly don’t know the answer to that. It seems like he certainly could nominate a skeptic if he wanted. The guy who is nominated for that role, Barry Myers, isn’t a climate skeptic to my knowledge, but he comes with a whole host of conflicts of interest. He owns AccuWeather and has spent years advocating for agencies to stop making publicly funded weather data available to the public except through companies like AccuWeather, who can repackage and sell it. But then, on the other hand, getting Myers confirmed doesn’t seem to have been a big priority for the administration, or he seems to have been met with significant resistance from Congress. This Washington Post story is from April, but he’s still in limbo. clare.malone: Wow. Well now I’m woke to Big Weather. maggiekb: You missed my spreadsheet of how many members of the Myers family are employed by AccuWeather or other companies that might represent a conflict of interest, Clare. Here’s a question that’s very much related to this report: How much does the U.S. pulling out of the Paris Climate Agreement screw up world progress on this? A lot, right? We’re sort of the big ole missing piece if you’re talking about the economic cooperation needed to forestall further damage, right? maggiekb: I mean, climate change is an international issue. And our country is one of the biggest sources of greenhouse gas emissions in the world. The fact that we haven’t been part of the international, cooperative work on this in decades is, yeah, a big deal. That’s before Paris, too, of course. This goes back to when we never ratified the Kyoto Protocol. But I think there’s a very good case to be made that American partisan politics — and the way that partisanship has settled around environmental issues — is a huge part of why we aren’t tackling climate change in a big way, globally. sarahf: So does this report move the conversation forward for the U.S. because it was published by federal agencies, instead of, say, a group of scientists affiliated with the United Nations who published a report in October that also predicts catastrophic global consequences? Or does it not really move the needle at all? And if it doesn’t, what does that mean for the U.S. if we don’t take action? clare.malone: I honestly think I have an uncertain handle on how urgently the American public thinks about climate change. I will say that the particular hellishness of the California wildfire stories seems potentially motivating for people. I’m curious as to whether 2020 Democratic candidates will put climate change front and center. maggiekb: Environmental stuff isn’t on the top of a lot of voters’ political priority lists, that’s for sure. It’s a thing we fret about, but not a major thing we vote on. Or tell people we’re going to vote on, anyway. natesilver: The public is reasonably convinced that climate change is real and manmade. And in general, the public has become more convinced of this in recent years. 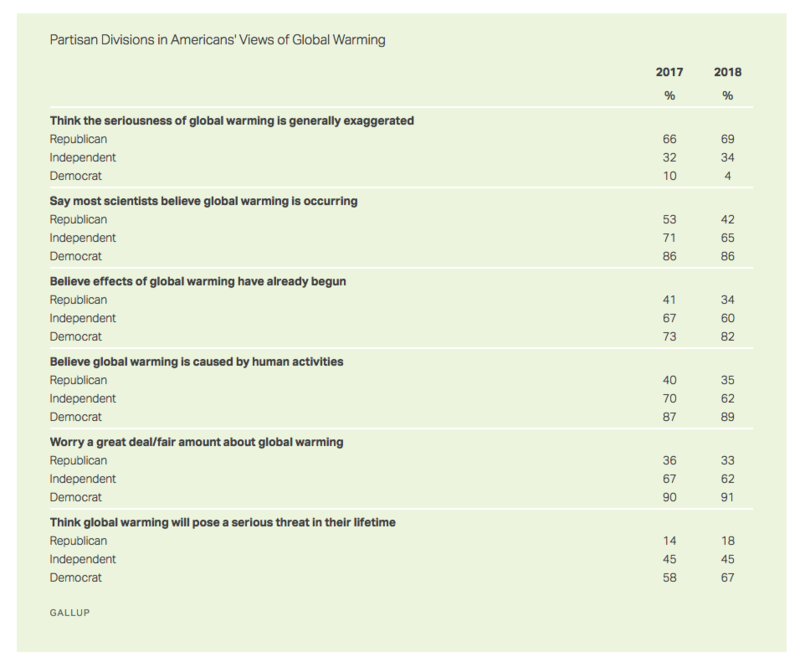 Trump may even have made people more concerned about global warming because public opinion often moves in the opposite direction of what the president believes, especially if the president is unpopular. maggiekb: Oh, that’s an interesting thought that some people might disdain Trump strongly enough to get over doubts about climate change. But are there a lot of people who both dislike the president and weren’t already on board with climate science? I guess maybe some of the Republican #NeverTrumpers? sarahf: Rep. Carlos Curbelo lost his re-election bid, but there is the House Climate Solutions Caucus, which he helped found. It has a number of Republican members and, according to that POLITICO article, the caucus apparently tripled in size after President Trump announced his decision to withdraw the U.S. from the Paris climate accord. natesilver: I mean, there’s certainly a position, which was once pretty fashionable within the GOP, that climate change is real and manmade but that we need market-based solutions, more research and development for carbon-capture technologies, etc. That was Romney’s position, right? Not that long ago. maggiekb: God. I guess you’re right. It feels like a long time? natesilver: Of course, Republicans may not have actually been interested in any substantive actions, including market-ish stuff like tradable permits. But there was at least lip service to the notion that climate change was real and the science was basically right. sarahf: That’s right. Taxes on carbon have long been an incentive to get conservatives on board! But it increasingly feels like without immediate action, we’ve missed the point of no return if we take these reports at face value. So I guess my question is: What comes of this? natesilver: What happens? The Democratic candidate for president makes a bigger deal of climate change than Clinton did in 2016. If he or she is lucky enough to win, they pass something through the House. But then it gets stymied in the Senate because the Senate has a built-in bias toward rural, agricultural states. The nature of the Senate — not Trump — is the biggest barrier to U.S. action on climate change in the long run, in my opinion. maggiekb: And what they propose is probably not as sweeping as it needs to be to really deal with the problem to begin with, if I can get climate hawkish here. And it’s probably for the same reasons that Nate just explained. We have a lot of forces in the U.S. that push our climate policy toward “not radical” solutions even as the problem becomes increasingly radical. sarahf: I hate to echo what Clare said earlier, but it probably will take widespread hellishness like the California wildfires to spark the U.S. to take radical action, and even that might be naive. natesilver: I mean, in some ways the climate change “debate” was a template for Trumpism. It involved a backlash against elites and empiricism, but the ultimate beneficiaries of the “populist” stance are not necessarily working-class voters so much as big, rich businesses. Which is not to say that there aren’t some voters in some regions who would be hurt by efforts to mitigate climate change. There certainly would be, especially in the short run. But it’s sort of a faux-populism where, conveniently enough, the populist stance also serves the interest of big, established businesses. maggiekb: Unfortunately, I think you’re correct about the parallels here, which makes finding a solution to mitigate climate change hard. Also, fun cameos from misinformation campaigns!